Why does iPhone Maps app sometimes ask to enable Wi-Fi for “accuracy”, even though Location Services (GPS) is enabled? I have an iPhone 3GS with iOS 5.1, and a 3G data plan that I keep enabled. I also keep "Location Services" (GPS) always on, since I use applications that take advantage of it. However, I make a point of keeping Wi-Fi turned off because it's a battery sucker and I seldom use the phone within range of a base-station for which I'd be authorized – and I dislike the practice of hopping onto unsecured "free" networks, even briefly. Sometimes when I need to look up an address or directions I use the Maps app. When I launch the app for the first time in what seems a while, I see a dialog telling me I should "enable Wi-Fi to improve accuracy". I forget the exact text for the dialog, but that's the general message and the buttons are "OK" and "Settings". ("OK" apparently meaning "I get it, now go away", as opposed to "OK, enable it.") I find the dialog both irritating, and puzzling. When I dismiss it, I still get an accurate location, far as I can tell! Why is it that Maps is telling me the location accuracy would be improved with Wi-Fi enabled? Is there some problem with GPS that Wi-Fi can somehow compensate for? I fail to see how this would be helpful. Isn't GPS accurate enough? In terms of dealing with the annoyance: Is there a way for me to silence that dialog once and for all? I dislike continuing to acknowledge something I've been informed of dozens of times already. The iPhone uses assisted GPS to improve the accuracy of the location system using GPS and cell towers. Wi-Fi networks are used to help determine the device's location; this is called a hybrid positioning system (XPS). Prior to iOS 4 iOS tapped into the Skyhook Wireless database of Wi-Fi hotspots and their locations. Apple disclosed in April 2010 that they had switched over to their own proprietary database. If Location Services is on, your device will periodically send the geo-tagged locations of nearby Wi-Fi hotspots and cell towers in an anonymous and encrypted form to Apple, to augment the crowd-sourced database of Wi-Fi hotspot and cell tower locations. In addition, if you are traveling (for example, in a car) and Location Services is on, a GPS-enabled iOS device will also periodically send GPS locations and travel speed information in an anonymous and encrypted form to Apple, to be used for building up a crowd-sourced road traffic database. The crowd-sourced location data gathered by Apple does not personally identify you. For your security concerns, read this Apple press release. A-GPS (Assisted GPS) is a method of localization where both GPS and cellular towers are used (cell-site triangulation) for improved accuracy. WPS (Wi-Fi Positioning System) is when you use Wi-Fi network identification for localization. 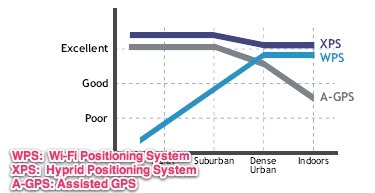 Hybrid positioning system (XPS) is the combination of both A-GPS and WPS. Using this combination you achieve maximum accuracy in both rural and densely populated areas. Hybrid positioning systems are systems for finding the location of a mobile device using several different positioning technologies. Usually GPS (Global Positioning System) is one major component of such systems, combined with cell tower signals, wireless internet signals, Bluetooth sensors or other local Positioning Systems. If you haven't used GPS for awhile, the GPS chipset won't have a current GPS almanac and ephemeris information. It takes up to a minute to gather enough of that information from the data the GPS satellites are sending to get a good fix, and it takes longer to collect a complete almanac and ephemeris information. If the device can narrow its location down to a few hundred feet then it can send that information to Apple's servers and they can generate enough of that information to get the GPS chipset to lock on to the satellites much more quickly. This is often referred to as "assisted GPS," although that title is relatively misleading in many ways. In theory it would be able to get that information from nearby cell towers, but historically iPhone ran on GSM, which had poor tower positioning capabilities when the iPhone first came out. Apple decided to go with wifi positioning primarily, and cell tower positioning secondarily. So yes, you will receive a better position faster if you are near a wifi hotspot that apple has mapped (and due to its data collection program it's got a lot of wifi signals mapped) if you enable wifi. I do not believe there's a way to disable the alert requesting you turn on your wifi. Ensure the date, time, and timezone are correctly set on the device in Settings > General > Date & Time. If possible, use "Set Automatically". Important: Incorrect settings on your computer can sync to your device. Verify the date, time, and timezone on any computer that syncs with your device. Verify that you have a cellular or Wi-Fi network connection. This allows the Assisted GPS (A-GPS) on the device to locate visible GPS satellites faster, in addition to providing initial location information using the Wi-Fi or cellular networks. Note: Microcells (sometimes called Femtocells) are not supported with Location Services. Maintain a clear view of the horizon in several directions. Keep in mind that walls, vehicle roofs, tall buildings, mountains, and other obstructions can block line of sight to GPS satellites. When this occurs, your device will automatically use Wi-Fi or cellular networks to determine your position, until the GPS satellites are visible again. In short, iOS uses crowd-sourced Wi-Fi in Apple's database to help fine-tune GPS measurements. The iPhone and iOS in general implements a hybrid GPS which relies on a database of known WiFi spots to pinpoint the user's location faster than with GPS and for added accuracy when conditions for GPS are not optimal (area with high buildings, indoors...). This database is built from anonymous data collected by iOS devices. While Apple used to rely on Skyhook for their WiFi location database they now are using their own according to this article. I don't have much more than anecdotal evidence to back this up, but I'm fairly certain the WiFi is also used to assist Apple's Region Monitoring feature. There's a post in the developer forums (I can't find the link, and I think you might need a developer account to access it anyways) from an Apple employee in late 2010 or early 2011 that indicates region monitoring is based only on cell towers (not the hardware GPS). We were having an issue today in an app we're testing where regions weren't being picked up by a particular phone. Then we realized it was the only phone with WiFi turned off (the others were on, but "Not connected"). When we turned the WiFi on, suddenly it started picking up everything. As such, if you intend to use apps like Banjo, Highlight, or anything using Geoloqi, I'd suggest turning your WiFi on for a better experience. Not the answer you're looking for? Browse other questions tagged iphone ios wifi gps maps . Why does GPS on the iPhone use so much power? Why does my Google Maps app not send location? Why does my iPhone 6 randomly ask me to enter my password with Touch ID enabled? iPhone7: Does anyone else show “Phone App” under Location Services? Why does iPhone “Time & Location” consume some much data?